Kaleidoscope Glasses are a type of light bending eyewear that refract and bend lightwaves that pass through the lenses. These glasses are commonly popular at raves, EDM festivals, and clubs to enhance light shows. You may have heard of another very unique product called Kaleidoscope Glasses, but are they the same as diffraction glasses? NO, very different in fact. The word “Kaleidoscope”originates from the early 19th century in Greek where kalos means ‘beautiful’, eidos represents ‘form’ and finally “scope” referring to the visual effects. Kaleidoscope glasses are becoming very popular across the nation, partly due to the celebrity exposure the glasses have had. They bend light through a series of faceted lenses that create duplicates of light waves. This effect is similar to that of a “bug eye” or repeating pattern. Some are infused with rainbow coloring and faceted in different ways to create remarkable visual effects and colors. These glasses are a phenomenal experience and surely a level above diffraction in intensity. Original – The Original Style Kaleidoscope Glasses from GloFX features maximum intensity crystal vision. These are dual faceted crystals intended to present the best kaleidoscopic experience possible. Flat Back – This style is lighter weight and best for kaleidoscop’ing on-the-go. This model is very popular for clubs and EDM festivals where dancing and movement is more popular. Wormhole – Sometimes called the “portal style” or “rabbit hole”, these lenses create a spiraling effect with a clear center. Experience maximum intensity in the peripheral, and clear vision in the center. These are more suited for walking around. Ultimate – Possibly our most stylish version, our Ultimate Kaleidoscope Glasses feature a flat back and come in several lens cuts. Kaleidoscope Monocle Necklaces – These utilize the same lenses, but are fashioned into a necklace. This also doubles as a great 3D Diffraction Camera Lens. One of the most important thing to remember is you want to keep your kaleidoscope glasses away from any hard objects and out of purses or backpacks that have loose items in them. Since some of our Kaleidoscope glasses are hand fumed to give their awesome effects, so it is best to keep away from any objects that could compromise the fuming of the glasses. We also recommend using water and a micro fiber cleaning cloth to ensure your Kaleidoscope Glasses maintain their pristine condition. 3.) Use only plain water and cotton or microfiber cloths to clean your lenses. 4.) Store your glasses in a cloth pouch or case when not in use to avoid contact with dirt, debris, and sharp objects. It is best to keep your glasses in a warm dry environment away from any sharp or protruding objects. Our GloFX Microfiber Carrying Case is perfect to store your favorite kaleidoscope glasses in, and is guaranteed to prolong the life of your glasses. And remember to always pull your carrying case shut to ensure no loose objects get trapped inside with your glasses. Now that you are an expert in all things diffraction, it should be more than clear why GloFX is the best option. But if it’s not, keep reading. There are many companies that sell kaleidoscope glasses, but at GloFX we take pride in our passion for diffraction and LED eyewear. Since 2009, our team has engineered and developed dimensional eyewear for entertainment purposes along with hundreds of other LED & Glow products, GloFX has led the industry since it’s start, first introducing a pair of hard frame laser etched diffraction glasses in 2009. Every year since, more and more frames and lenses been released from GloFX. Since 2012, GloFX has been in high gear releasing multiple new models every month. 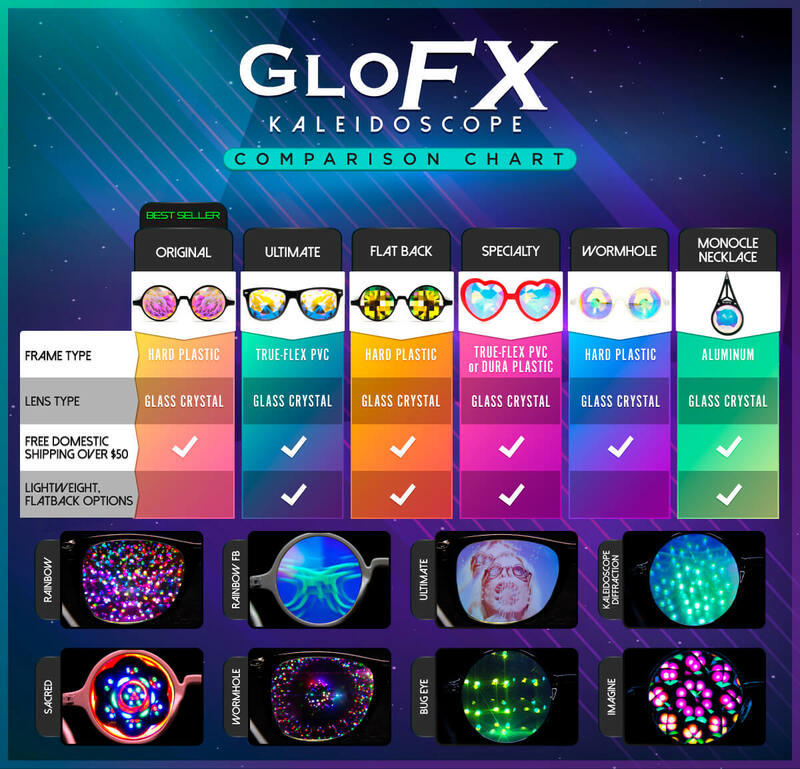 Now offering the largest selection of kaleidoscope frames and lenses available on the market, it should be obvious GloFX has the edge. Quality and craftsmanship are prime components of GloFX Glasses, along with renowned effects and styles you cannot find anywhere else. On top of that, all glasses come with our GloFX 100% Satisfaction Guarantee. It’s doesn’t stop there, GloFX ships all orders within 24 hours, offers remarkable customer service, and holds the largest inventory to ensure your choice product is in stock.